Yesterday, Noel and I ended a date in the ER. You could say it had been “one of those days.” There’s that saying that bad things come in threes and if I count only the major offenses of yesterday, that seems fairly accurate to me. The day started out innocuous enough. We slept in and were lazily making breakfast. (Oh, summer, we will miss this part of you!) One of the kids wanted to let the cat out and I gave my permission as long as they watched him. (He’s an insanely good hunter, but the bunnies in our area are diseased so we can’t let him roam). A few minutes later, one of them ran into the house in a state of distress. The cat had climbed to the top of our very tall tree. This in and of itself does not bother me, he’s a cat, they climb stuff, but he was yowling and neighbors had come out into their yard concerned. We had plans for the morning, but I didn’t feel right leaving the cat when he’d garnered such attention. 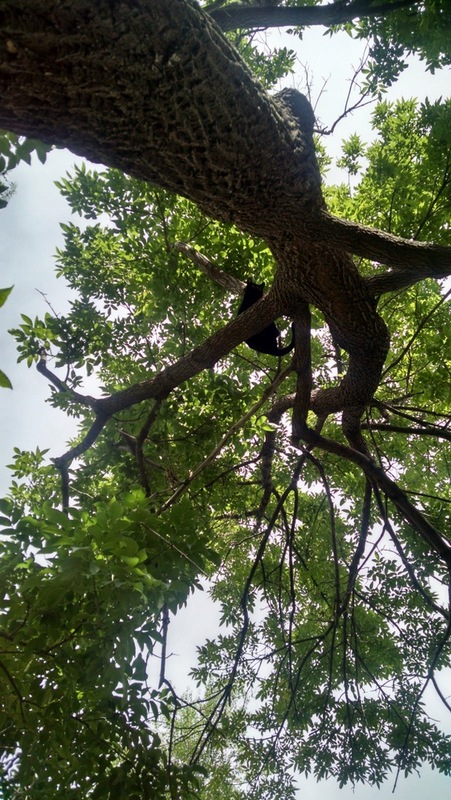 (Plus, I worried one of the neighbors would call some type of authority if I left and wondered if abandoning your cat in a tree would be considered animal cruelty.) So, we cancelled our plans and waited, and coaxed, and tried to look concerned instead of ticked off. Finally, after three hours, the insufferable creature climbed out of the tree. We carried on with our day. There was therapy, laundry, and a date to prepare for. I went downstairs to change some laundry and when I returned upstairs I heard Ellen run to her room and shut the door. I went to check on her and found her with my haircutting scissors. (Which are kept in my bathroom on a shelf she can’t reach.) Because I had not been gone long, I felt certain I had nipped this one in the bud and started in on a mini lecture. Midway through I noticed her bangs, or rather a nice cropped section in the middle of them. I asked her to take a seat at the kitchen table while I retrieved a comb to see if this was something I could fix. 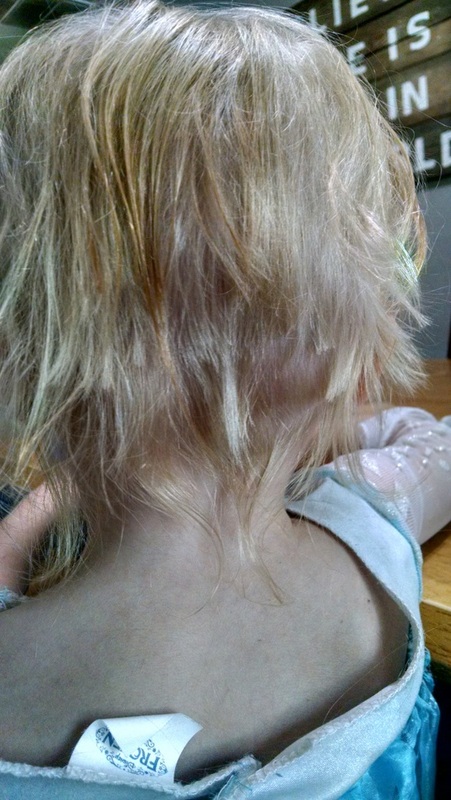 On the way down the hall I spotted several tufts of hair and quickly returned to the dining room to inspect the back of her hair. There won’t be any pigtails on the first day of school, that’s for sure. By this time, I was really looking forward to the date I’d planned for Noel and I that evening. We left the kids with our capable babysitter and headed off to have a picnic and go rollerblading. First, the storm clouds rolled in and poured rain. We picnicked under a pavilion and laughed at what a crummy day it was. 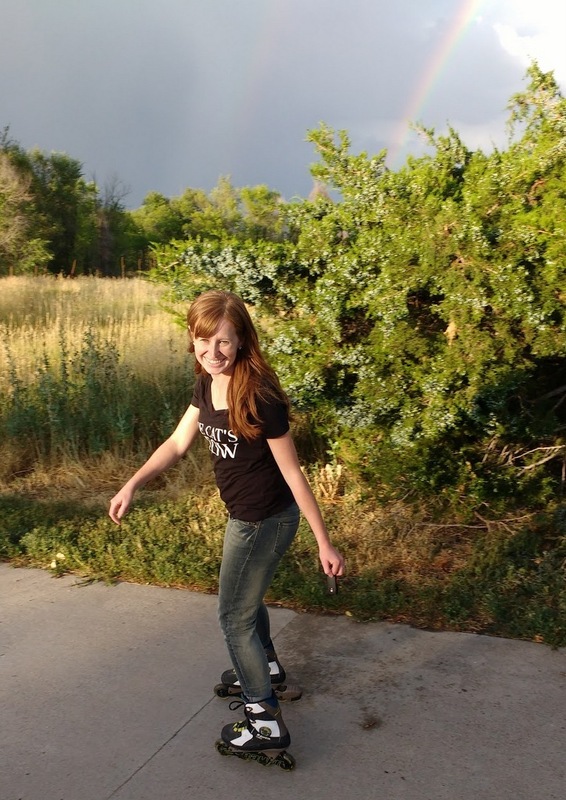 After the rain subsided, we put on our rollerblades. Back in the 90’s my whole family had rollerblades and since my feet haven’t grown sine then mine still fit. When we found a pair of rollerblades in Noel’s size at an REI garage sale I knew it was meant to be. This was to be our debut as a super fun, rollerblading couple. We headed down the slight incline towards a path that went around a “lake.” Within 20 feet Noel was flat on his back and when I went to pull him up he very matter of factly told me, “I broke my arm.” He was so calm I didn’t believe him at first, but he was adamant. So, we made our way to car and over to the ER. Good thing we already had a babysitter. 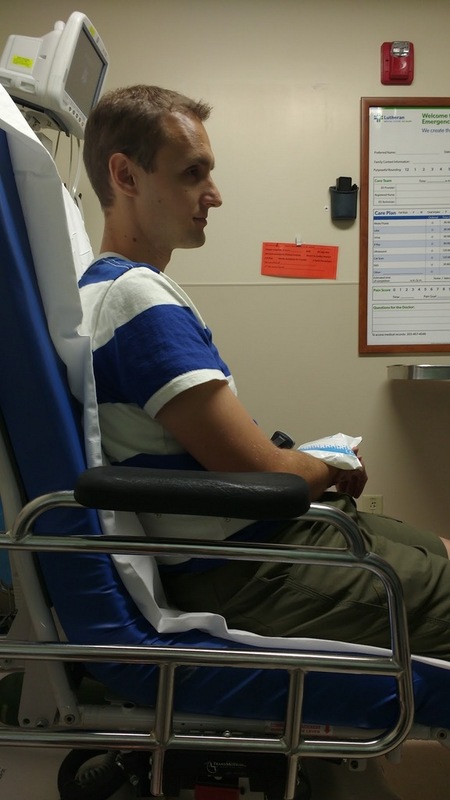 We walked into the ER, me wearing a completely juvenile t-shirt announcing I’m “The Cat’s Meow” and Noel clutching his arm. When the admittance staff asked what happened we couldn’t stop laughing. It was all just so terrible that it was funny. * We spent the 2nd half of our date in the ER getting x-rays, listening to the pained screams of fellow ER patients, and setting Noel up with a splint for his fractured radius. I’m pretty sure Noel will be referring to this date in the future as the worst date ever. *The things going terribly wrong, but still laughing about it reminded me of the talk “Come What May, and Love It” by Elder Joseph B. Wirthlin. We aren’t always good at laughing when things go wrong, but when we are I’m amazed at how much better it makes tough situations. I’m so sorry about the lousy day! Although, I will say, when I read about the kids being left with a sitter, and you had started out your post mentioning the ER, I was worried that something happened to one of your kids while you were out (maybe because that’s one of my big fears). I’m glad Noel is OK, and glad it wasn’t the kids! Man, what a day! You won’t ever forget it, that’s for sure! I’m so sorry . Life is exciting isn’t it? Thinking of you all. I’m glad you’re laughing about it, because then I don’t feel so guilty doing the same. Your account of the day is hilarious! 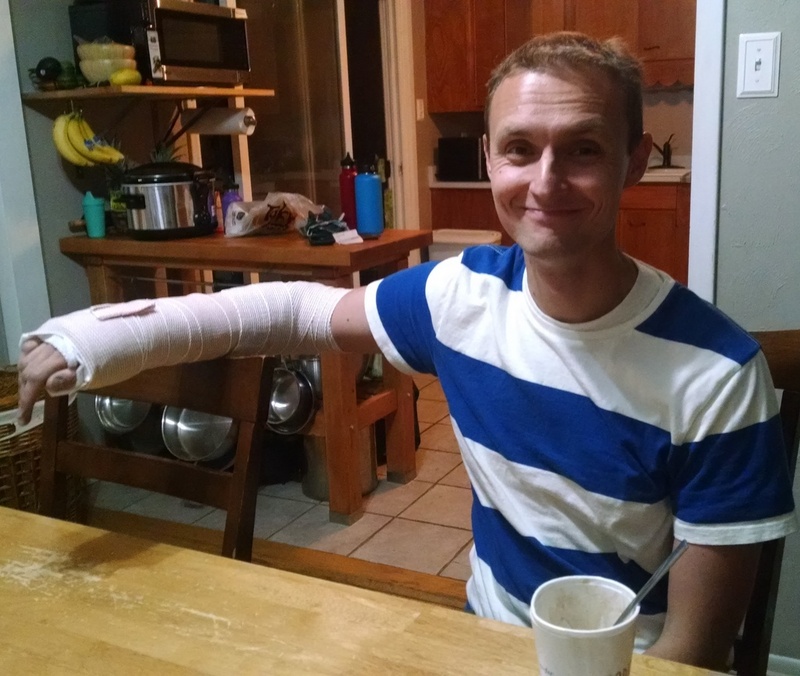 Ask me sometime about our broken arm/ER/laughing like a loon story. Laughing really can be the best way to handle some things.